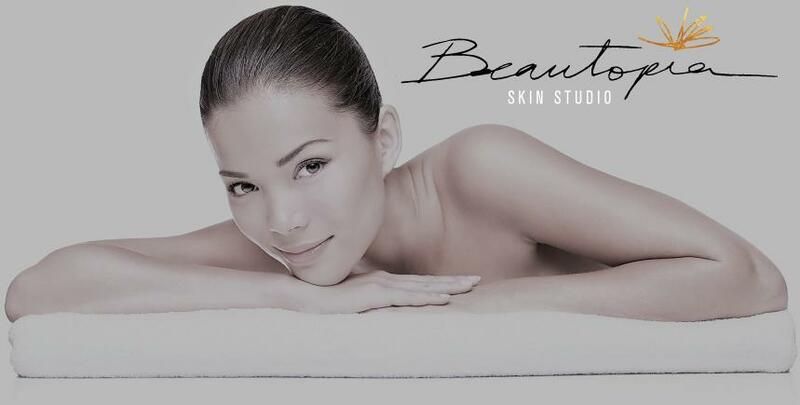 At the Beautopia Skin Studio we are committed to providing the most innovated and safest service for our clients. That is why we use only innovative and scientifically advanced custom designed pigments and OSHA certified processes and procedures to insure the health and safety of our clients. I get treated for acne and Ashley is so great at what she does. I have come along way from where i started with bumps and dark blemishes all on my face. Within the first 2 weeks i could tell the difference. As i consistantly keep up with the treatment and going the long run i dont see any pimples or dark blemishes on my face. And thats what i like. And will continue using face reality skin care. I love Ashley! She's so patient and understanding and knows exactly what my skin needs. I've always had acne and discoloration but never knew what I needed to do or how important a face regimen is. She has changed my skin drastically and improved my confidence in myself. I highly recommend her to everyone I come across! ashley knows what she is doing and she does it well. she took the time to get to know me and (most importantly) my skin, crafting up the perfect series to help improve my overall appearance. i have never felt pressured on an upsell, and i always leave feeling and looking good. her bedside manner is superb. 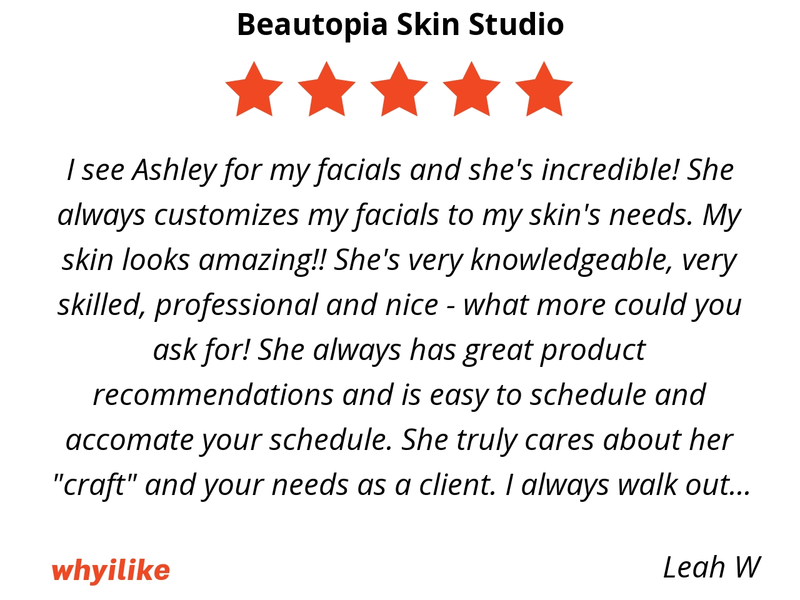 i look forward to my visit each month with ashley and would recommend her to anyone! 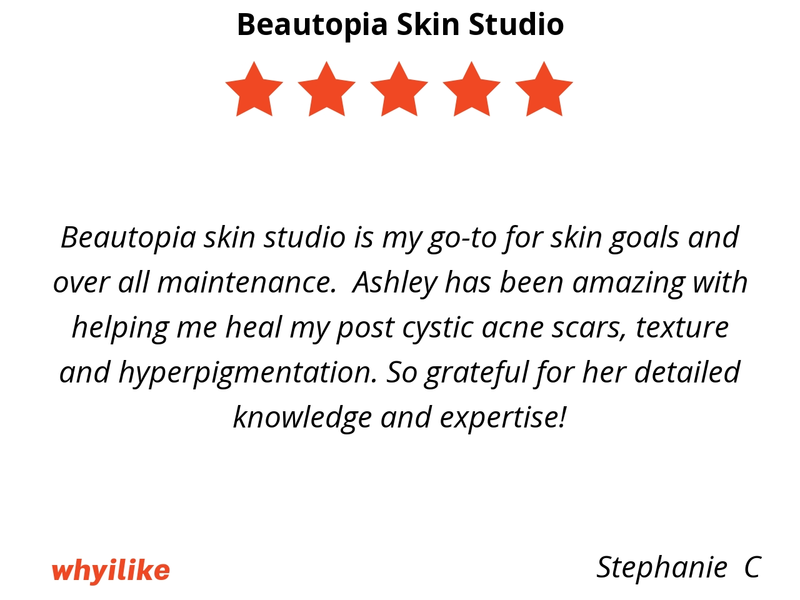 Beautopia skin studio is my go-to for skin goals and over all maintenance. 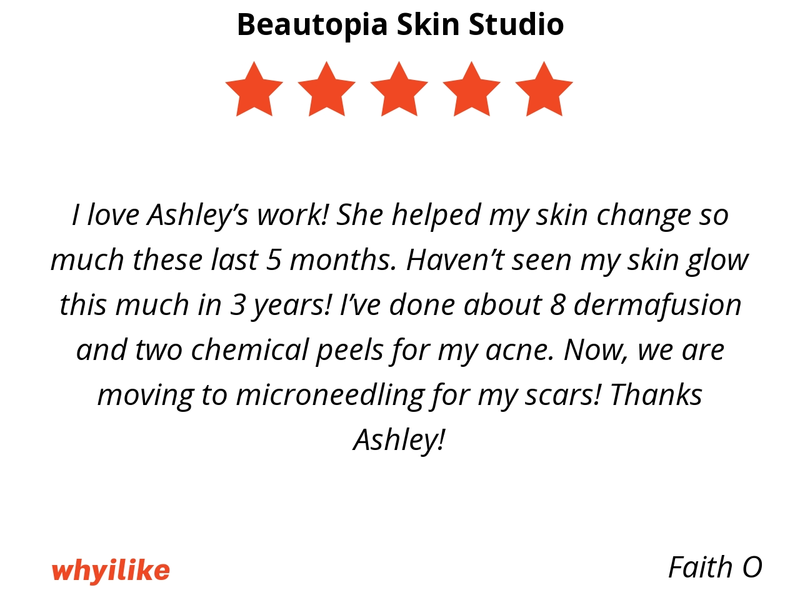 Ashley has been amazing with helping me heal my post cystic acne scars, texture and hyperpigmentation. So grateful for her detailed knowledge and expertise! Ashley is fantastic. She’s the perfect blend of reliable and educated professional and a creative artist. 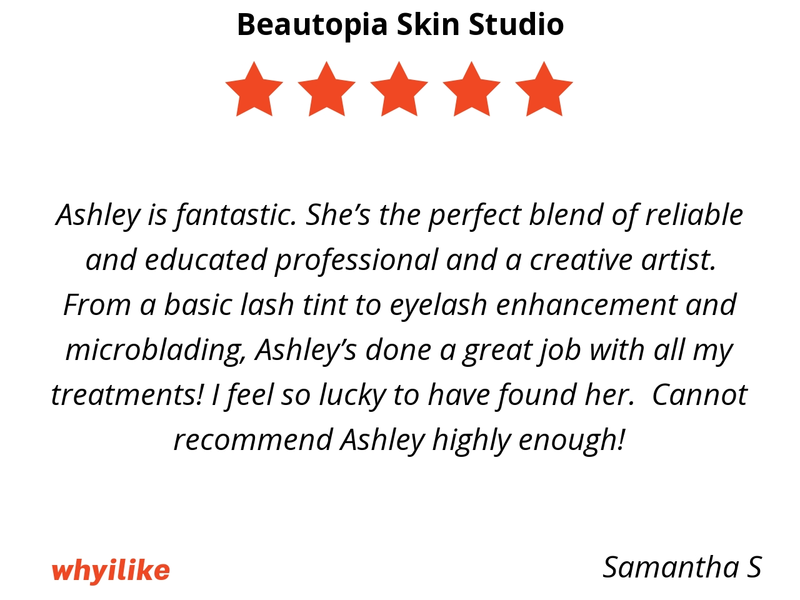 From a basic lash tint to eyelash enhancement and microblading, Ashley’s done a great job with all my treatments! I feel so lucky to have found her. Cannot recommend Ashley highly enough! Definitely- Ashley! I had my lips and eye liner applied twice and just had my brows microneedled a week ago. My lips and liner looks so natural and I rarely wear makeup and feel so confident. And the brows have been a surprising wonderful addition. Again natural. Most of all with Ashley, perfect and experately applied. Loving it! When I first visited Ashley, I didn’t know what I needed with my eyebrows. 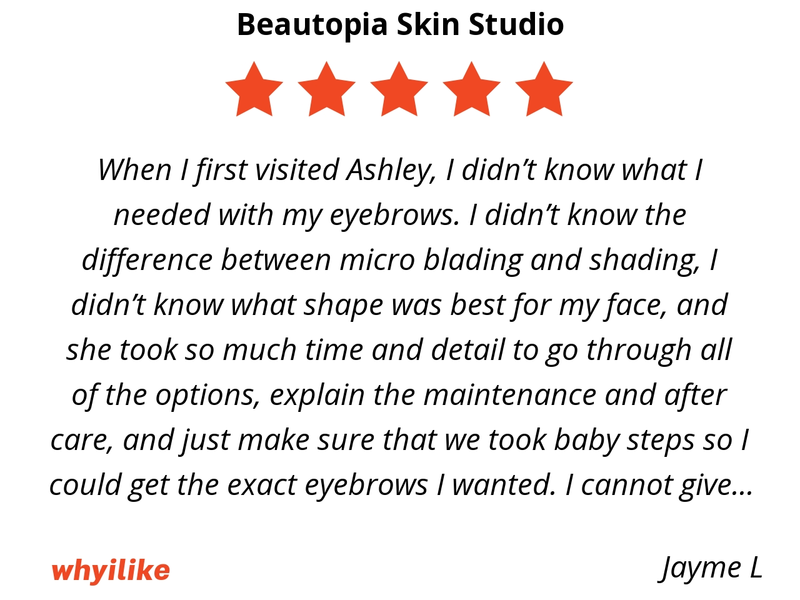 I didn’t know the difference between micro blading and shading, I didn’t know what shape was best for my face, and she took so much time and detail to go through all of the options, explain the maintenance and after care, and just make sure that we took baby steps so I could get the exact eyebrows I wanted. 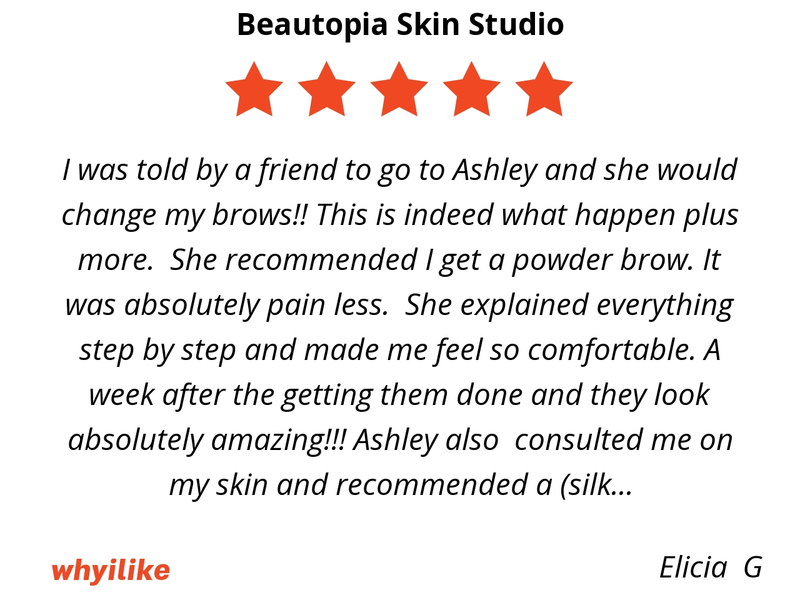 I cannot give her enough positive praise for the amount of information,l I didn’t know what I needed with my eyebrows. I didn’t know the difference between micro blading and shading, I didn’t know what shape was best for my face, and she took so much time and detail to go through all of the options, explain the maintenance and after care, and just make sure that we took baby steps so I could get the exact eyebrows I wanted. I cannot give her enough positive praise for the amount of information and time she gave to me to make sure I was happy with the end product. She is such a doll to spend time with, her space is super clean, and she truly cares about her clients. I highly, highly recommend her to any of you. 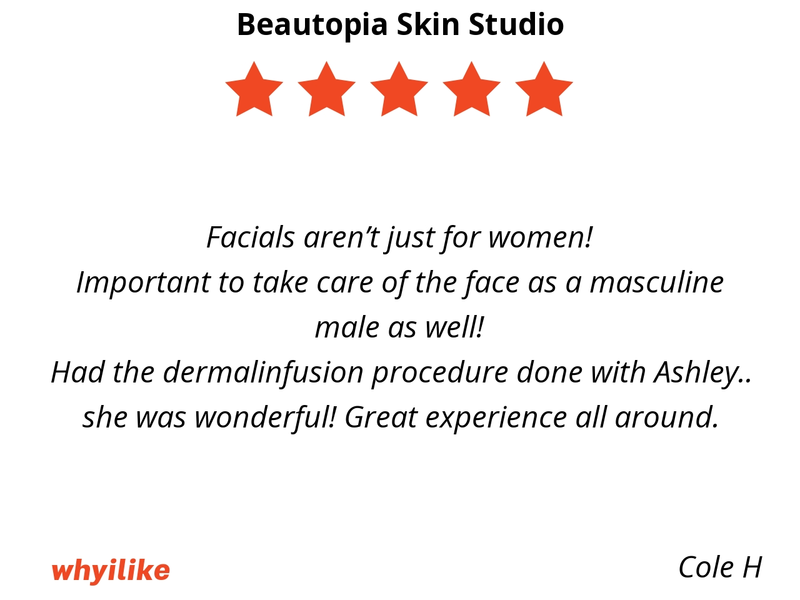 Facials aren’t just for women! Important to take care of the face as a masculine male as well! Had the dermalinfusion procedure done with Ashley.. she was wonderful! Great experience all around. My first experience was amazing! I received a dermalinfusion and dermaplaning. From the moment I walked in Ashley made me feel comfortable and relaxed. 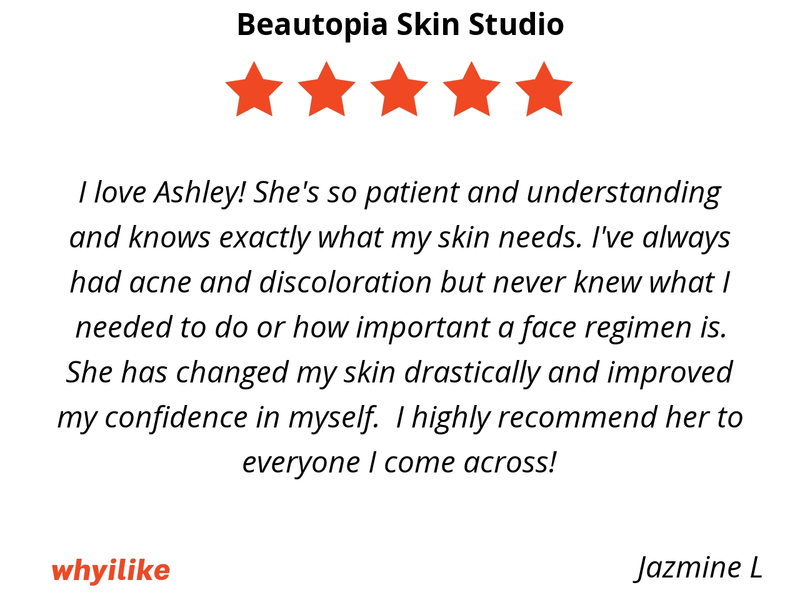 She was able to answer all my questions and gave me great advice for what my skin needs. My skin looks so refreshed and I can’t wait to come back! Ashley is amazing! So easy to talk to and really listens to your requests and concerns. Went for microblading and had a great experience, I wanted a natural look since I rarely wear makeup and that’s what she delivered. I’m very happy with my new brows. Since then I have been back several times for dermal-infusions and to purchase product. 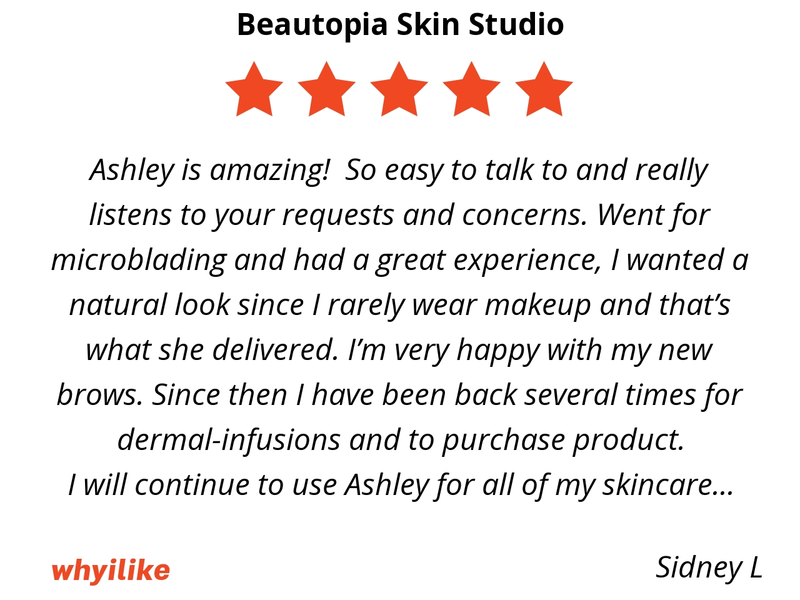 I will continue to use Ashley for all of my skincare needs!! I love Ashley’s work! She helped my skin change so much these last 5 months. Haven’t seen my skin glow this much in 3 years! I’ve done about 8 dermafusion and two chemical peels for my acne. 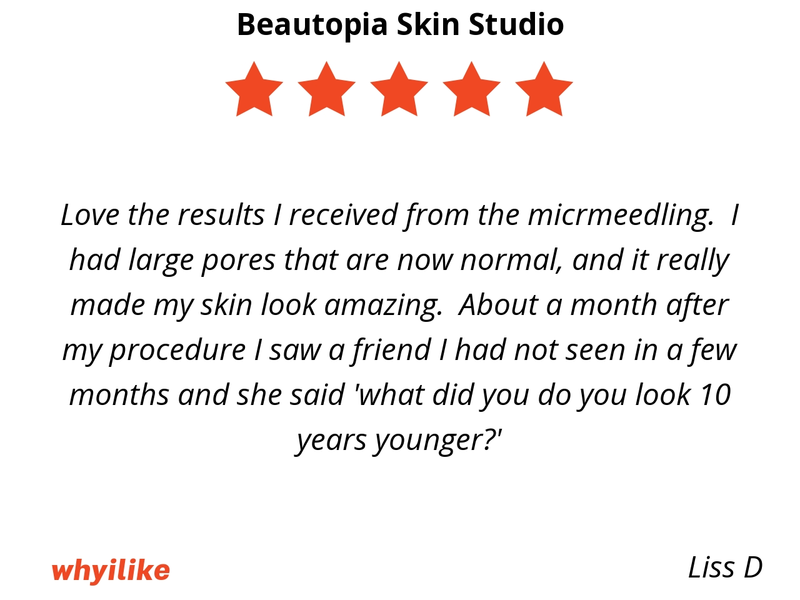 Now, we are moving to microneedling for my scars! Thanks Ashley! 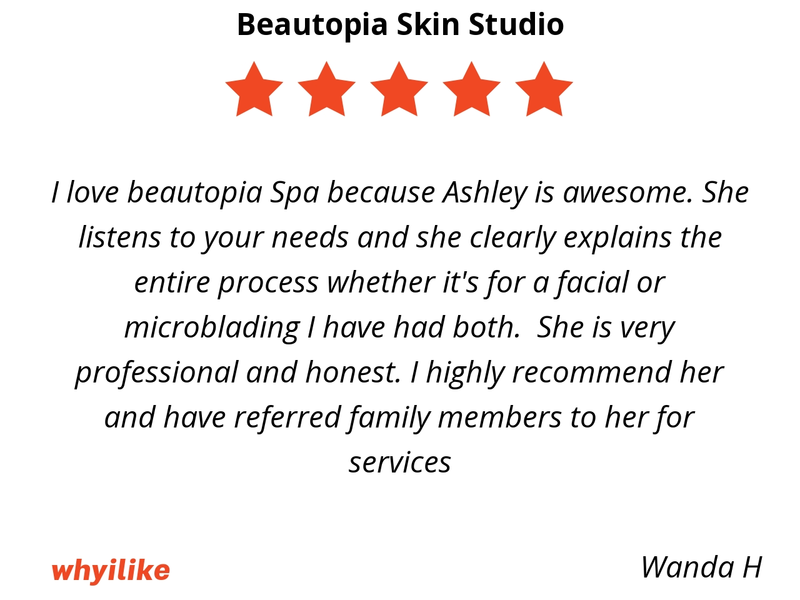 I see Ashley for my facials and she's incredible! She always customizes my facials to my skin's needs. My skin looks amazing!! 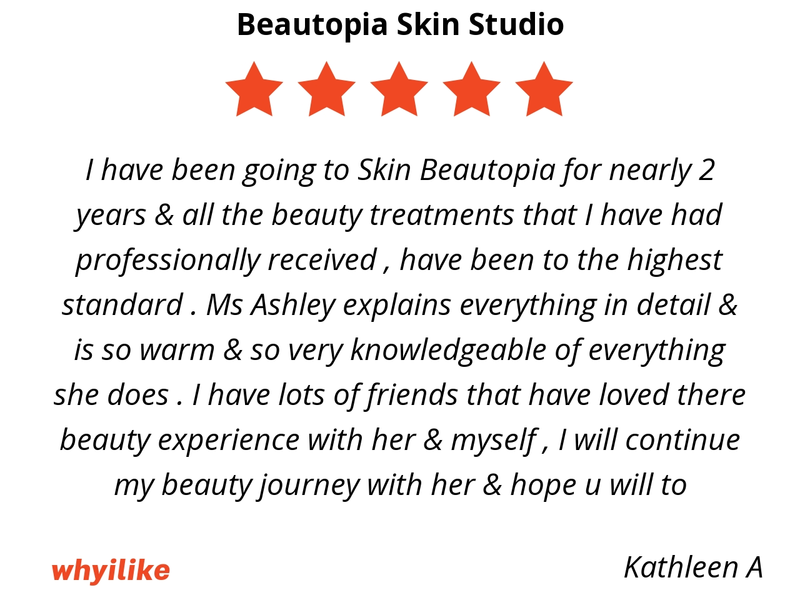 She's very knowledgeable, very skilled, professional and nice - what more could you ask for! 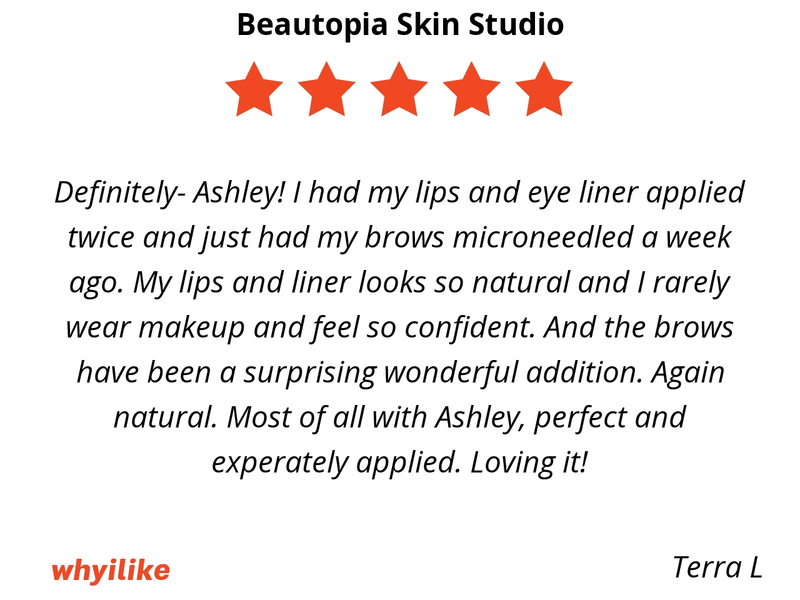 She always has great product recommendations and is easy to schedule and accomate your schedule. She truly cares about her "craft" and your needs as a client. I always walk out of her studio glowing and happy! Thanks, Ashley!! I was told by a friend to go to Ashley and she would change my brows!! This is indeed what happen plus more. She recommended I get a powder brow. It was absolutely pain less. She explained everything step by step and made me feel so comfortable. A week after the getting them done and they look absolutely amazing!!! 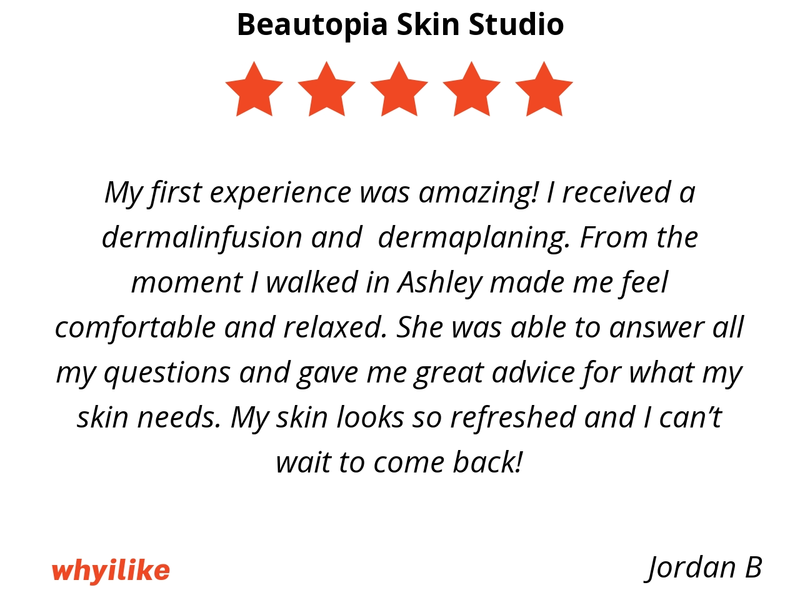 Ashley also consulted me on my skin and recommended a (silk peel/Dermalinfusion ) omg!! My skin is so happy and with following her advise on skin care. I can honestly say I don’t need foundation all the time. Ashley was so sweet and her skin was glowing. It was an hour of bliss and painless. I'd never seen my face look so fresh. Thank you so much you are a life saver! I like going here because Ashley is very patient and professional. I first saw her work on my sisters eyebrows so i put an appointment for my really bad previous eyebrow tattoo. 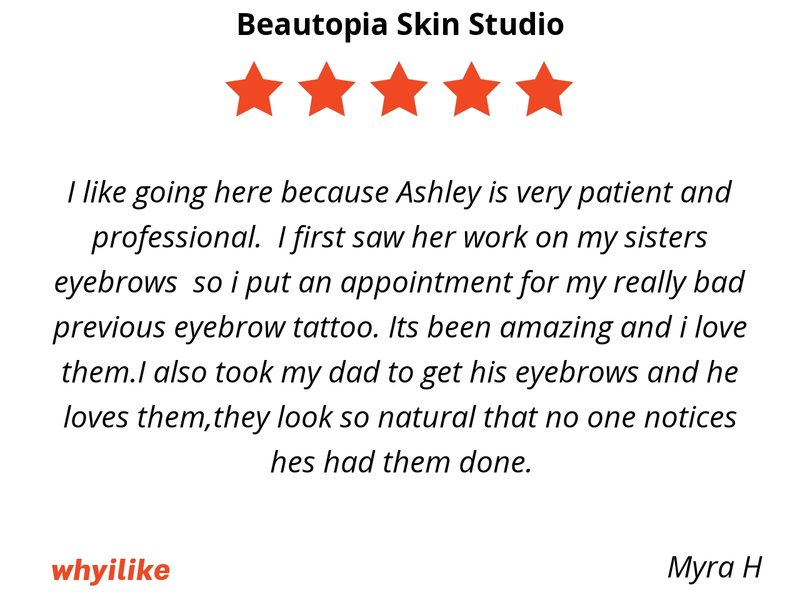 Its been amazing and i love them.I also took my dad to get his eyebrows and he loves them,they look so natural that no one notices hes had them done. I went to Beautopia Skin Studio for my first facial and I must say my skin feels clean. 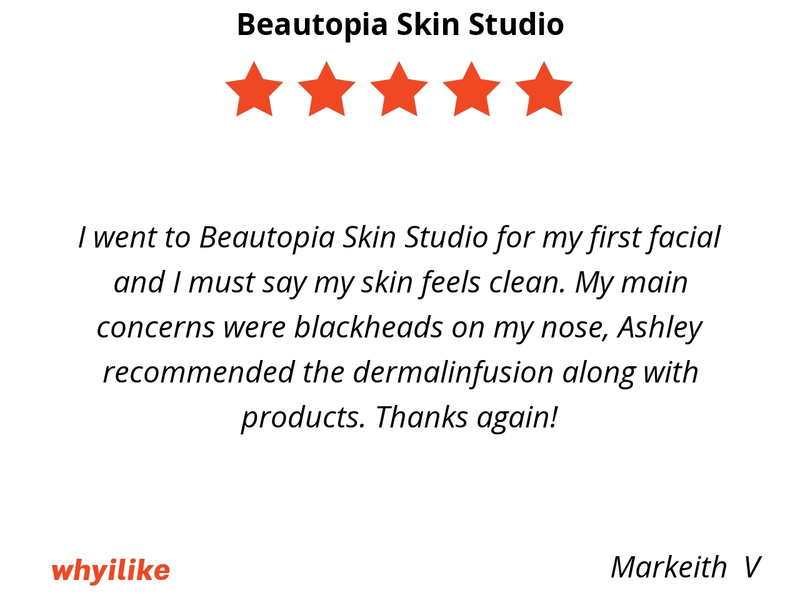 My main concerns were blackheads on my nose, Ashley recommended the dermalinfusion along with products. Thanks again! Booking appts are super easy! 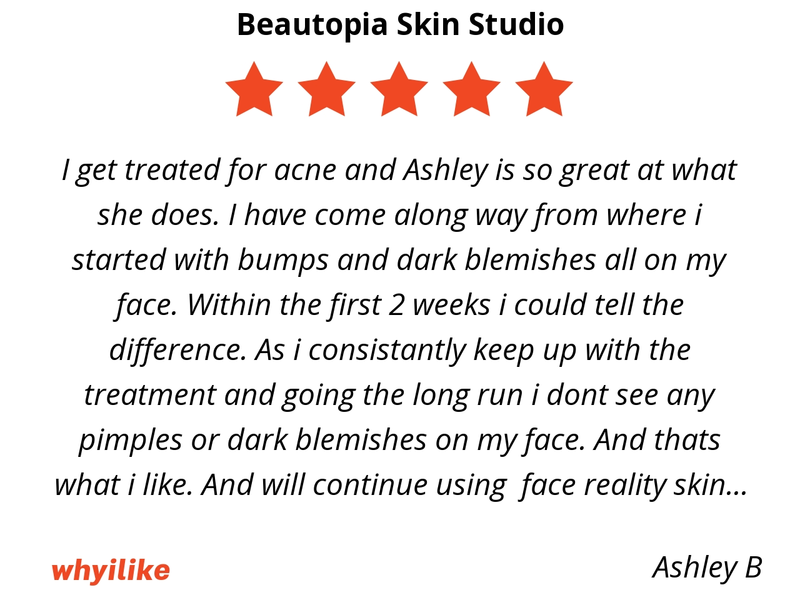 I don’t think i have ever felt confident in my own skin... until I started seeing Ashley! feel good about going out and running errands without makeup... which speaks volumes! I love how private it is as well! 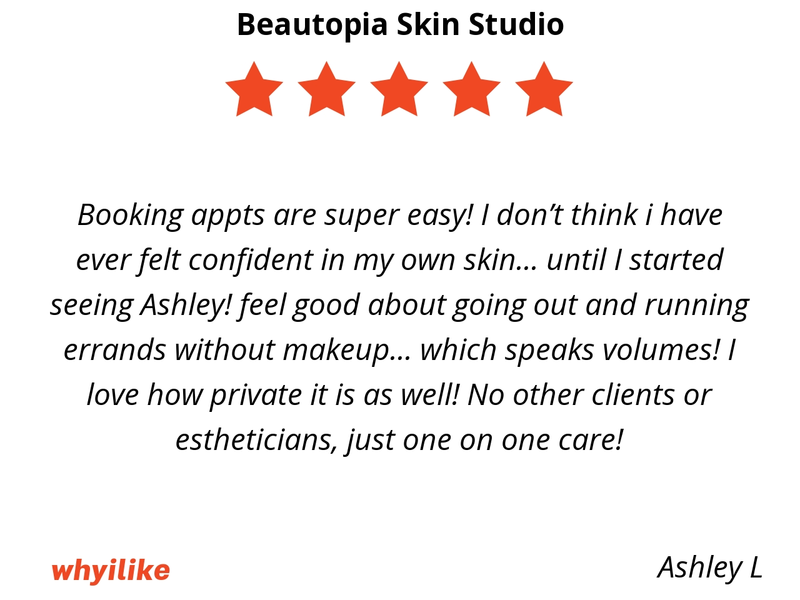 No other clients or estheticians, just one on one care! 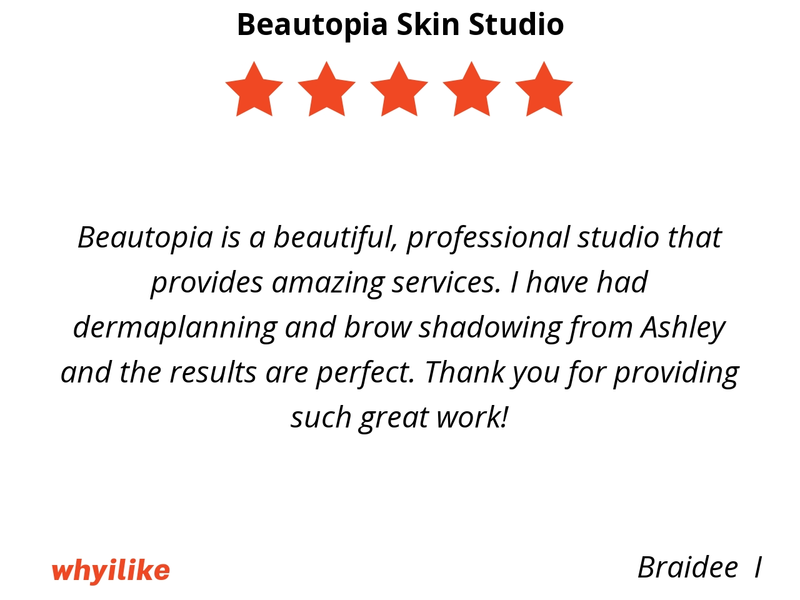 Beautopia is a beautiful, professional studio that provides amazing services. I have had dermaplanning and brow shadowing from Ashley and the results are perfect. Thank you for providing such great work!